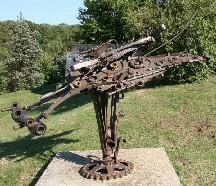 "The Butterfly", along with "The Sibyl" is one of two iron assembled sculptures by Giuseppe Marinucci. They were donated by his heirs to the City of San Benedetto as gratitude for the importance given by the City to the artist's work, who died during one of his major retrospective exhibition. The work, currently in the wonderful Palazzina Azzurra gardens, is 2 meters high, 135 long and 223 wide. It was made by assembling pieces of metal from various sources and is equipped with a system that makes the sculpture rotate on itself. Giuseppe Marinucci (Ascoli Piceno, 1925 - 1981) dedicated his life to Art since he was young by attending Ghino Sassetti's pottery workshop, a professor at the Academy of Fine Arts of Urbino, who taught him the rudiments of sculpture. He was also influenced by Medardo Rosso and the French impressionists. Marinucci turns his attention to the disintegration of matter. The masses are reduced to lines of force, the plans multiply and intersect, make up and break down so that it becomes possible to insert a deeper space, because space itself becomes a sculpture.